The book is A5 size, printed on good quality glossy paper and approx 285 pages long. As far as construction goes it is well put together and a bit of thought has gone into it. The glossy paper feels as if it will put up with being in a damp tent and rucksack. There is a ribbon fixed into the spine to use as a book mark which although a small thing is extremely useful and a nice touch. If you have a look on the Cicerone page you can read the introduction, see the table of contents and see a sample section so I will not copy that information here. This is not just a book of recipes, although it does have these, they are only about a third of the content. 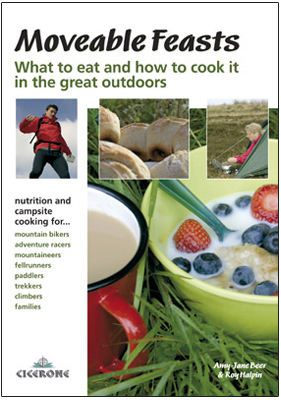 The rest of the book covers all you need to know about eating and cooking in the outdoors. From nutritional guidance about the mix of foods you need, the amount of calories, why never to do a weight loss diet when tripping. Then on to the different stoves for cooking. The merits of these, the benefits of different fuels and their availability and storage. Cooking pots and the range of things you may want to add to your camp kitchen are also covered. Water sterilisation, containers, storage, transporting, quantities required and more are all covered as well. Different food choices are discussed, from dehydrated space meals to fresh wild food with all the variations in between. Even the seasons for different wild foods are deal with. Transporting food and packing get the treatment as well. All of this information is discussed and compared to different types of activity. So recommendations are made for marathon racing as compared to car camping. What you should consider when kayaking that would not be as important for a hiking trip. Given that Amy-Jane is a biologist and Roy a geography teacher they tend to back up their opinions with facts and figures. This does not detract from the book nor is the book a dry academic text. it just shows that they have done the research to back up their practical experience. And let us be clear this book is the result of a lot of practical experience of eating in the outdoors. You can tell the authors have sat in a muddy field in the pouring rain trying to make something edible after a long day travelling. And you can tell they have done this often and put a lot of thought into making sure they are well fed. Excellent review about a "must have" book. I have just followed the link to the recipe that is given as an example. Anyone who suggests custard and crumble as a breakfast gets my vote, what a delicious way to start the day. Well that's going on my Christmas list. Thanks for the review MK. Well thank you very much for the kind review! Really hope the book continues to be useful to you. Re canoeing... for the record I'm pretty much dependent on two blades but Roy paddles and coaches open boat stuff as well and frequently hints that more canoeing would vastly improve my kayak skills. We just need a bigger shed! Anyway, maybe we shoud get a 4.5 out of 5? Looks ok, but is this a veggie only book?? . From the cover and the pictures it seems aimed more at the Family camping veggie. There seems are lots of books in much the same vein, so it's got a lot to compete wiith. And looking at the size it seems rather large to keep in your rucksack/drybag. But I'm one of those that waits till I'm hungry then throws everything into one pan . Last edited by bothyman; 5th-December-2008 at 10:28 AM. Reason: ?????????????????????????? It'll be right, trust me, I'm a Yorkshireman. ::>>> I'd rather be lucky, than good. I was looking at this book last week in my local Waterstones and thought it looked like a good read. Not at all bothyman, lots of meaty recipies too, and suggestions for ways to cater for mixed meaty/veggie groups too. You'll find there are sections aimed at families, others aimed at adventure racers, trekkers, long expeditions, short Dof E type expeds and so on. We figured people camp in many different ways, and in fact most will camp in several ways over time (we certainly do), so we tried to cover a wide range. And as John says, its more than a recipe book and as far as we can tell it's the most comprehensve treatment of the subject in the Brit market. Other books are recipe books with a bit about kit, technique books with a bit of nurtrition, nutrition books with a few recipes etc. We've given equal importance to all these aspects of campsite cooking, and sqeezed in as much as we can into 280 pages. But it's great to hear feedback and once you've read it , we'd welcome your ideas for the second edition! I'll order it when that gets answered. If it doesn't have half a dozen ways to cook a sausage then it's no good to me!! It's not just a recipie book it is full of useful information regarding nutrition, equipment, how to cook, sourcing your ingredients and so on. The recipies are not just your standard 'camp slop' they are proper meals. There isn't a boil in the bag meal in sight! A good review - the book is now on my Christmas List. I was given a book token for Xmas. My usual process when spending a book token is to wander around the book shop grasping my token tightly in my sweaty palm agonising about what to spend it on. However this time I knew as soon as I had flipped through a few pages of this book that this was the one for me, and in a matter of minutes of entering the store I had spent my gift! Now - I consider myself to be a seasoned outdoorsman and in matters culinary in the outdoors, I thought that there wasn't much more that I needed to know. How wrong I am! This book has awakened my sense of adventure and I am looking forward to trying out some of the ideas that I have gleaned already. The menus are interesting enough for me to give them a go and they look easy to apply out there in the field. I am a meat eater and married to a veggie so the attention given to both philosophical feeding habits is very welcome. I used to work as an outdoor instructor for many years and I still lead groups from time to time. In the past, 'in my day', we did not pay much attention to the importance of cooking well - it was considered a necessary function of the expedition and anyway, what could you do with dehydrated rations? If only I had had a book like this when I was starting out in the 80s - my groups would not have suffered the fate of overcooked rations and the ignomy of having to scrub away at hoplessly burnt Trangia pans. Of course I am older and wiser now and I would like to think that I would give as much attention to the cooking of healthy and tasty meals if I were to do that work again. However, I have to admit that my present menu planning for my trips is rather staid and unremarkable. This book will change me forever! What I like about the book is its tone. It is written with a friendly feel to it, almost as if I were out there with Amy and Roy and they were imparting there aquired wisdom in an anecdotal way. In my experience this is the best form of teaching (and learning) where I feel I am encouraged to be creative and give things a go. There is also enough factual information too, and indeed I find the pages on nutrition fascinating to read, especially the requirements for fell running and mountain marathons, having entered the OMM for the first time last year (the famous one). I highly recommend this book and if I had the power to, I would suggest this as an essential book on the reading list for instructor training establishments and colleges. Cheers indeed Nick, that was great to read, you just made my day! Have a look at this article and here for ideas. And a few recipes ideas here. How on earth could this possibly be a good book? Just look at the cover, there's NO titanium mug, bowl or spoon!..... None! Humour apart, this looks great, I'd not seen it before, and a good review too! Just bought a copy for £10:59 delivered, from The Book Depository.Co.UK. (Sourced via Book Butler). Last edited by helixpteron; 11th-October-2009 at 10:41 PM. Reason: Add info.